We are more than excited to show you our newest remodel that is very close to our hearts. Patti & Gary transformed what was once their rental property into their personal home. Walk through with us as we unveil this complete transformation from drab to fab! Cabinetry was designed to include open shelving giving the white landscaped kitchen an opportunity for pops of color. Classic white subway tiles were modernized with a selection of the contrasting gray sparkle grout. Under cabinet lighting adds to this light and bright space, highlighting personlized details. 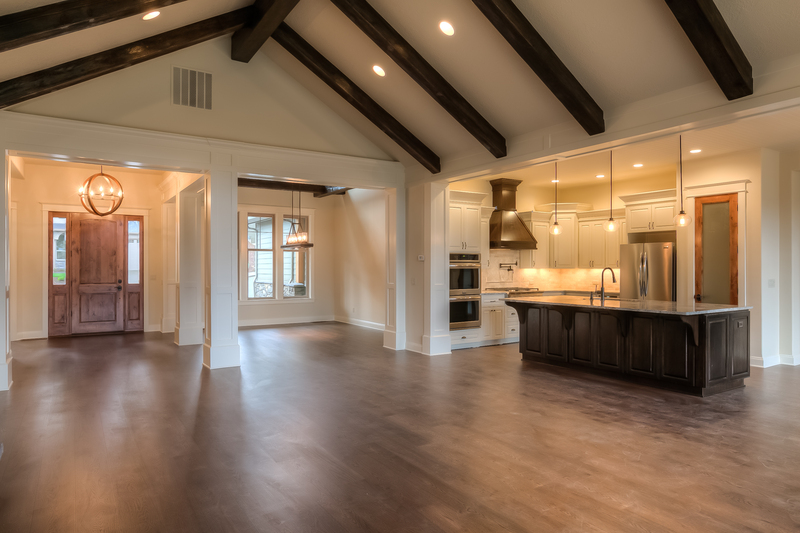 Because this home is a small rancher, our focus was to make every space usable and allow as much light in as possible. 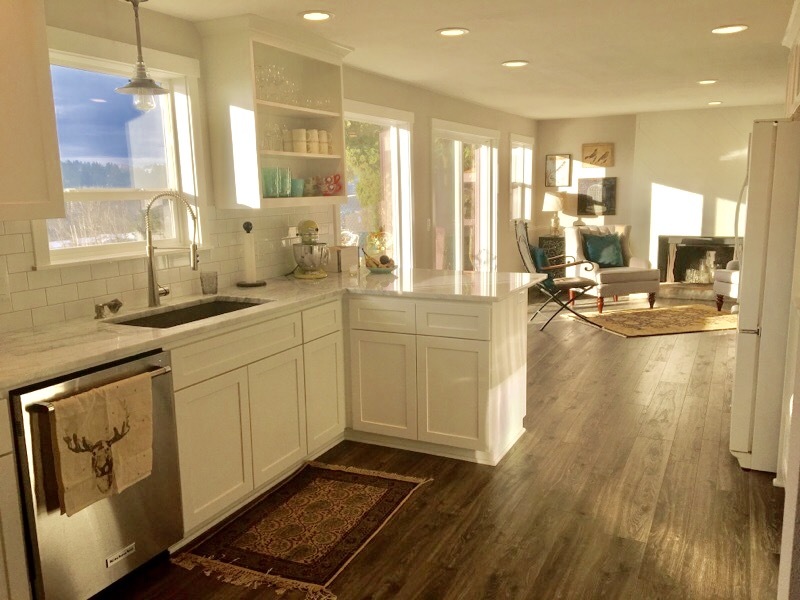 The new kitchen design is light and open, new windows were installed throughout as well as laminate wood flooring creating a much more cohesive flow. Industrial inspired lighting was selected above the kitchen sink. Shaker cabinet fronts, recessed lighting, modern fixtures and a white pallet completely transformed this space.The kitchen footprint was extended for more counters space and storage while furniture was selected to define the seating area. Patti loves the farmhouse modern feel bringing in pieces salvaged from their former acreage property. This wire rack provided an innovative storage idea for homes without pantry space. 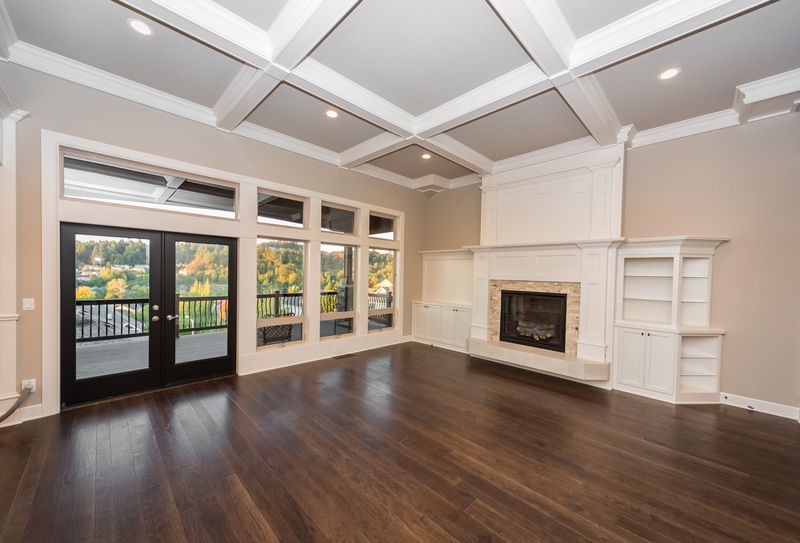 Each of our remodels showcases the ability to bridge the gap between style and functionality. The wall between the kitchen and dining was widened adding to the open concept. Light paint throughout makes the smaller spaces appear larger and creates a clean vibe. A new coat of paint for the fireplace quickly modernized the outdated prior fireplace look. The choice was made to simply paint the fireplace so that the original character of the wood paneling was still present. This before and after photo is one of our favorites! This new light fixture has a unique design with beading, iron and wood details. Patti loved how wood rustic details paired with white industrial metal chairs balanced the space. The vintage french doors were salvaged from her previous home. The entryway was opened up by removing the dated spindles and trimming out the existing half-wall. A mix of masculine and feminine furniture balances the living room. All interior doors were painted gray for an unassuming design aspect. The fresh paint is a cost saving alternative to all interior door replacement. The dark color selected accentuates the character of the interior doors. A new front door and hardware throughout further updated the home. Thank you for walking through with us! More project details to follow as more work is completed. Nice colors in all of the applications, looks lovely! Patti and Gary, What a beautiful job! This is why the two of you make such a great team!